This week it's 1time airlines' time in the sun. We looked at flights from Durban to Johannesburg and 1time airline flight 1T214, leaving Durban at 1850 and arriving in Johannesburg at 2000 was cheapest (R409). Even using the Mango Airlines promotional code ("PNMS01") only managed to reduce the Mango price from R663 to R572 (remember to use the Mango promotional code when booking your Mango flights - you may get a 15% cheaper flight). 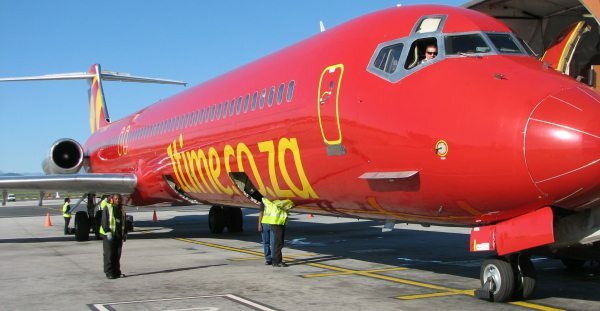 It's been a while since 1time airline topped the SouthAfrica.TO charts - in fact we have to look all the way back to last year, the 22nd December 2007 when 1time offered the cheapest flight from Johannesburg to Durban. And when last did 1time airline offer the cheapest flight from Durban to Johannesburg - that would be as far back as the 8th September 2007 (the flight cost R369). Unlike the airline industry with their rapidly changing flight prices, bus prices are relatively stable. In the last two times we've surveyed bus prices from Durban to Johannesburg, SA Roadlink have been cheapest (at R99). There's now been some inflation and a change in leadership (City to City are cheapest at R110). In fact other than Baz Bus which remains constant at R1020 (and are really in a different market), all the bus prices went up slightly. Once you get to OR Tambo International, you may want to hire a car. As has become the norm in these surveys, Tempest Care Hire are the cheapest. For the first time we have First Car Rental in our survey (they were previously known as National Alamo Car Rental, however Europcar have purchased the "National" and "Alamo" brand names, necessitating the change). When you get to Johannesburg you may need some place to stay - many passengers arriving at Joburg are in transit, so stay near OR Tambo Airport. The Road Lodge (part of the City Lodge Group) perenially offers the cheapest prices. A photo of a Virgin Atlantic Aircraft parked at Johannesburg Airport (O.R. Tambo International Airport). Photo taken in January 2008. "Only Ryanair guarantees no fuel surcharge on all of our fares, not now, not ever. Why don't BA reduce other costs instead of always gouging their passengers." Michael O'Leary (the top dog at Ryanair) comments on the fuel surcharge on British Airways flights.